It has been too long Malaysians have waited for a event that reward its participants and yet excites the public. Time Attack – The Mission is to achieve the fastest Circuit Lap Time possible in differing car categories according to car, engine and drive type. 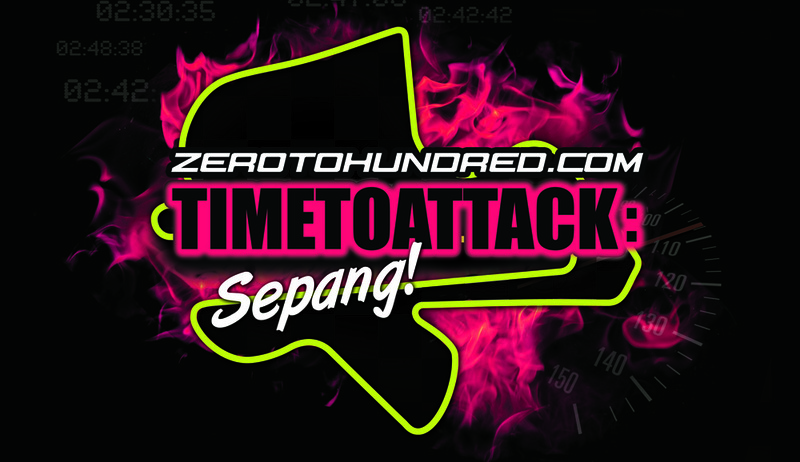 TIMETOATTACK is Malaysia’s first and most celebrated Time Attack event currently based in the Sepang F1 Circuit. TIMETOATTACK Round 1 in 2010 was a huge success as part of Zerotohundred.com’s 10th Anniversary effort. Showcasing a maximum of 100 elite participants ranging from high performance Japanese cars as well as European Exotics. In May 2010 despite the seemingly impossible time of two weeks preparation schedule, we’ve managed to attract substantial involvements, with names like Goodyear, Lotus Cars Malaysia, Renault, Honda, MOFAZ, and other Automotive SME industry players: Links Racing, Pentagon Racing, Kazama Autoworks and Exotic Mods. The spectacular Round 2 of the TIMETOATTACK Sepang, lived up to the hype. A massive turnout. The larger number of time attackers numbering at a cool 106 cars, were mainly categorized into the street car, supercar and race car categories with each being further classified according to his or her car’s drive train layout, engine type, as well as the extent of modification done to the car. With this being the basis of equal competition, each attacker was given their allocated laps to prove their worth. However, none of the times posted in Round 2 matched the magical number from Round 1 despite the very favourable dry weather. Commonly referred to as Time Attack, it was made popular by the record-setters at the Tsukuba Time Attack in Japan. Thought of as a proving ground for Track Day enthusiasts and Tuners, the unique and competitive time focused challenge sets apart the boys and the men on the race circuit. An event by Zerotohundred.com, The Car Enthusiasts’ Community. TIMETOATTACK debuted in May 2010 with exploding success throughout the 4 rounds held that year. It was a series of Time Attack event commemorating Zerotohundred.com’s 10th year anniversary. The TIMETOATTACK also acknowledges all participants’ achievements with a prestigious Hall Of Fame that lists in detail a driver’s name, car, tyres used and their best lap times. It is the only Time Attack Event that offers this feature and a permanent one that will be proudly displayed on TIMETOATTACK.net and Zerotohundred.com! Pit Allocations for TIMETOATTACK This Sunday at Sepang Circuit – May 20th 2012!